If you're a regular reader then you probably know I'm not the biggest fan of mayo. It has its place, in small amounts, but there are certain recipes where it's a primary ingredient, thus harder to avoid. Like spinach dip, potato salad, and creamy coleslaw, for example. Thankfully, it's easy to swap out mayo for a mustard or vinegar based dressing instead. Or, in the case of my spinach and artichoke dip, which uses all sour cream. Don't get me wrong. I still enjoy creamy slaw and deviled egg potato salad with mustard AND mayo. But, more often that not (especially in the case of slaw), they're overdressed. Soggy. Swimming in dressing. I don't know about you, but I like my slaw crunchy! The texture is important. As is what goes into the recipe. My other issue is with commercial slaw dressings. I don't know the last time I had a creamy slaw with dressing made from scratch. 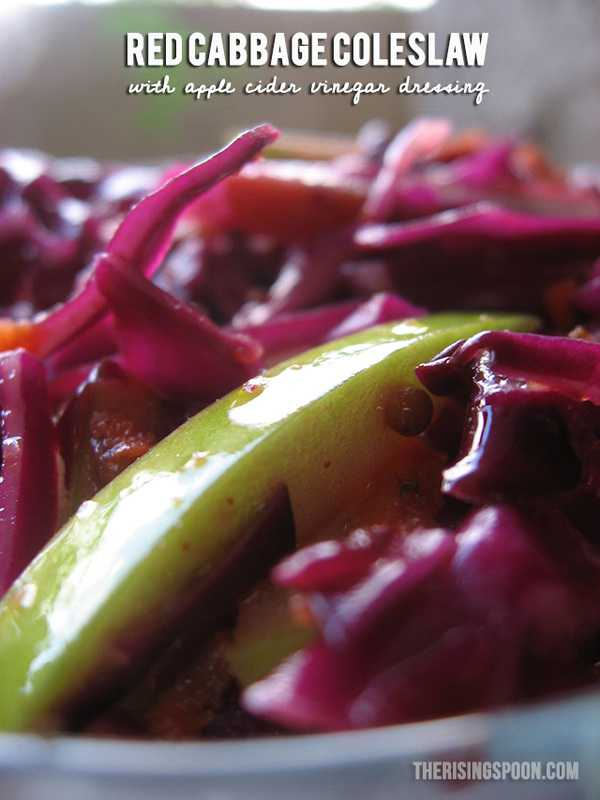 Most people (and certainly restaurants & grocery stores) use bottled coleslaw mixes and pre-shredded cabbage. The convenience is definitely tempting, especially when you're preparing a bunch of other dishes at the same time. The first ingredients are usually either HFCS. If you're lucky, it'll be sugar, but that's almost always followed by soybean or canola oil. I don't want a dressing that is primarily heavily processed sugar and GMO oil. Or a dressing with a sugar as the main ingredient. Gross. If you'd like to avoid this, I recommend making your own homemade mayonnaise, since that's the major component for creamy slaws. It only takes a few minutes to make a small batch with an immersion blender. 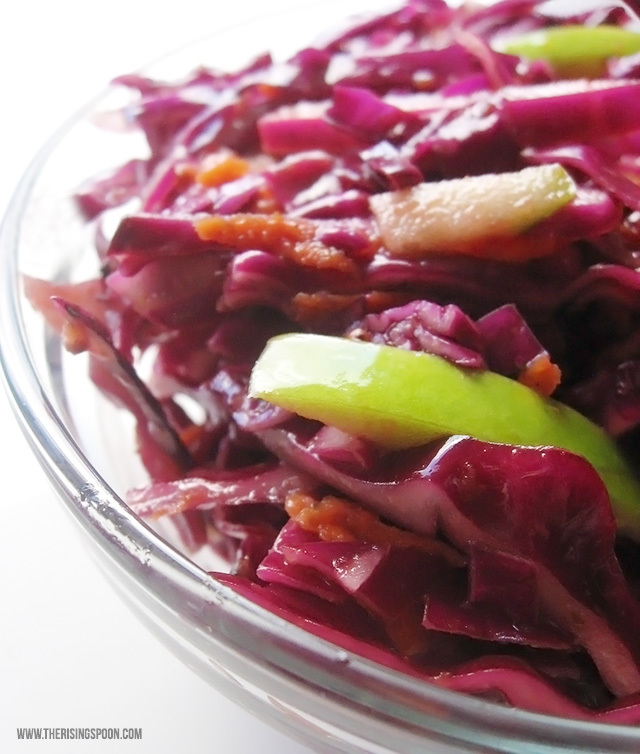 In the meantime, give my crunchy & tangy vinegar-based slaw a try! 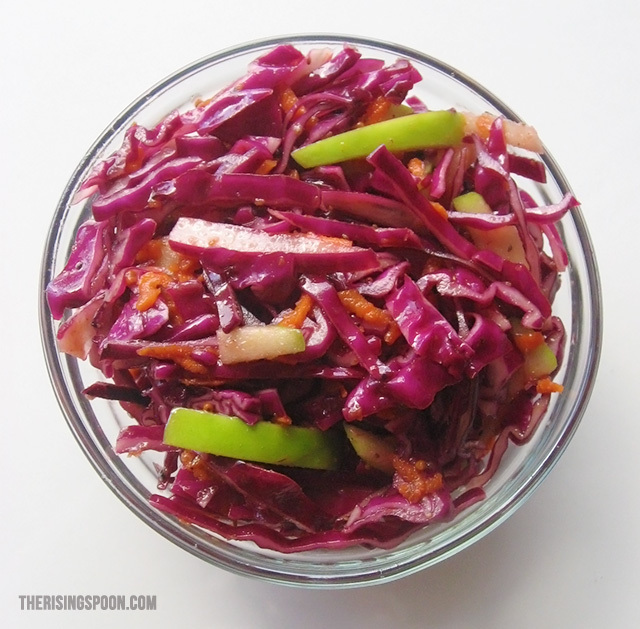 Shredded red cabbage, carrots, and granny smith apple lightly dressed with a homemade apple cider vinaigrette. A tangy alternative to creamy slaw that's also vegan-friendly and paleo. Peel off the outer bits of the cabbage, then cut it into four pieces, remove the cores and shred it using a very sharp knife. Alternately, you can use a food processor OR pre-shredded cabbage. Peel and shred the carrots with a cheese grater. Cut, core and slice the apple into small pieces (similar to matchsticks, but they don't have to be perfect). Measure all of the ingredients for the dressing into a small bowl or container with a tightly fitted lid. Stir and taste. This is important. Adjust the seasonings so it's tangy or sweet enough to your liking. Once it tastes good to you, slow pour in the olive oil while whisking vigorously so the dressing emulsifies. Alternately, you can combine everything in a container with a tight lid and shake it until the dressing is mixed. Combine the slaw and dressing in a large bowl and toss to coat. Sprinkle with celery seed, sea salt and cracked black pepper, to taste. Serve immediately. The dressing is very much adjustable. Lots of people like sweet slaw, so if it's too tangy for you, simply increase the amount of maple syrup. For more tang, increase the vinegar. What's your favorite type of slaw: creamy or tangy? Is there a particular dish you love to serve with it? This post is also linked to Allergy Free Wednesdays & Whimsy Wednesdays.